This week, we focus on land performance as an investment, in our Annual Nairobi Metropolitan Area Land Report for 2018. We highlight the land sector’s 2017 performance, across 18 suburbs and 11 Satellite Towns in the Nairobi Metropolitan Area (NMA), based on annual capital appreciation, and compare this with the 6-year growth rates to enable us identify trends, and hence have an outlook for the sector, as well as an investment recommendation. According to the report, land in the Nairobi Metropolitan Area recorded an average capital appreciation of 3.7% in 2017, compared to the 6-year CAGR of 17.0%. The best performing submarkets were in the high end residential zone, which had an annual appreciation rate of 4.8%, followed by low end residential zone, which recorded an annual appreciation of 4.5%. Site and Service schemes in Satellite Towns had the lowest returns, recording annual appreciation rates of 2.7%. The opportunity in the sector is in markets with high returns such as Karen, Kilimani, Ridgeways, Juja and Kasarani, which recorded annual capital appreciation rates of more than 7.5% in 2017 and are thus the most attractive areas both for land investment and real estate development. During the week, T-bills were oversubscribed, with the subscription rate coming in at 106.1%, down from 162.5% the previous week. The subscription rates for the 91, 182 and 364-day papers came in at 26.8%, 115.6%, and 128.4% compared to 129.3%, 179.5%, and 158.6%, respectively, the previous week. Yields on the 91, 182 and 364-day papers remained unchanged at 8.0%, 10.3% and 11.1%, respectively. The acceptance rate for T-bills declined to 76.7% from 81.4%, the previous week, with the government accepting a total of Kshs 19.5 bn of the Kshs 25.5 bn worth of bids received, against the Kshs 24.0 bn on offer. The government is currently 28.5% ahead of its domestic borrowing target for the current fiscal year, having borrowed Kshs 316.3 bn, against a target of Kshs 246.1 bn (assuming a pro-rated borrowing target throughout the financial year of Kshs 297.6 bn). This week, the Kenyan Government issued 2 bonds, FXD 1/2008/15 and FXD 1/2018/20, with 4.9-years and 19.9-years to maturity, and coupons of 12.5% and 13.2%, respectively, in a bid to raise Kshs 40.0 bn for budgetary support. The overall subscription rate for the issue came in at 81.9%, with the weighted average rate of accepted bids coming in at 12.3% and 13.3%, respectively, in line with our expectations of 12.1% to 12.3% and 13.0% to 13.3%, respectively. The government accepted a total of Kshs 26.9 bn of the Kshs 32.8 bn worth of bids received, translating to an acceptance rate of 82.2%. However, as detailed in our Cytonn Weekly #16/2018, we don’t expect the Government to come under pressure to borrow given that (i) the government is currently 28.5% ahead of its pro-rated domestic borrowing target, and has met 72.9% of their total foreign borrowing target and 88.1% of its pro-rated target for the current fiscal year, and (ii) the KRA is not significantly behind target, having collected 91.2% of its half year 2017/18 target. Liquidity levels declined in the money market as indicated by the increase in the average interbank rate to 4.8% from 4.6% recorded the previous week, as banks made Value Added Tax (VAT) payments. There was a decline in the average volumes traded in the interbank market by 4.2% to Kshs 13.8 bn, from Kshs 14.4 bn the previous week. According to Bloomberg, yields on the 5-year and 10-year Eurobonds issued in June 2014 increased by 20 bps each to 4.2% and 6.1% from 4.0% and 5.9%, respectively, the previous week. 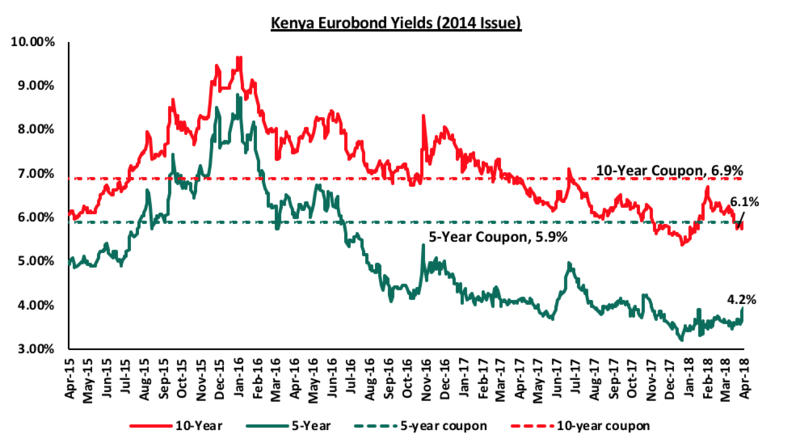 Since the mid-January 2016 peak, yields on the Kenya Eurobonds have declined by 4.6% and 3.6% for the 5-year and 10-year Eurobonds, respectively, due to the relatively stable macroeconomic conditions in the country. Key to note is that these bonds currently have 1.1 and 6.1 years to maturity for the 5-year and 10-year bonds, respectively. For the February 2018 Eurobond issue, during the week, the yields on the 10-year and 30-year Eurobonds increased by 10 bps each to 6.8% and 7.9% from 6.7% and 7.8% last week, respectively. Since the issue date, yields on the 10-year and 30-year Eurobonds have declined by 0.5% points and 0.3% points, respectively, indicating foreign investor confidence in Kenya’s macro-economic prospects. Notably, the yields on Kenya Eurobonds increased across all tenors, the rise being attributed to varying market sentiments from foreign investors, according to the CBK. High forex reserves, currently at USD 9.5 bn (equivalent to 6.4 months of import cover), and the USD 1.5 bn stand-by credit and precautionary facility by the IMF, still available until September 2018, after which a new facility will be discussed. We are projecting the inflation rate for the month of April to range between 3.7% - 4.0%, from 4.2% in March. The y/y inflation rate is expected to decline as a result of a base effect but m/m inflation is expected to rise due to the increase in electricity prices brought about by the 50.0% rise in the forex levy to Kshs 1.4 per kilowatt hour (kWh), despite the fuel levy remaining unchanged. This however is expected to be countered by a decline in the transport index due to the 0.6% decline in petrol prices to Kshs 106.8 per liter from Kshs 107.5 in March. Kerosene prices declined by 0.9% to Kshs 76.7 per liter as well, while diesel prices remained unchanged at Kshs 97.9 per liter. Going forward, we expect inflation to average 7.0% over the course of the year down from 8.0% in 2017, which is within the government target range of 2.5% - 7.5%. During the week, the Kenyan Government was expected to pay an outstanding USD 646.0 mn (Kshs 64.6 bn) of the USD 750.0 mn syndicated loan agreement with a consortium of lenders in October 28, 2015 which was set to mature on April 27, 2018. The loan was expected to be financed by the proceeds of the recently issued USD 2.0 bn Eurobond and is set to reduce the foreign reserves which hit an all-time high of USD 9.5 bn equivalent to 6.4 months of import cover as at 26 April 2018 possibly weakening the Kenyan shilling. Average deposit rates increased to 8.2% in December 2017 from 7.3% in December 2016, while commercial bank average lending rates remained unchanged at 13.6% in December 2017. Total domestic credit rose by 7.9% compared to 6.4% in 2016, primarily due to a 12.1% growth in credit to the national government, compared to the decline in private sector credit growth to 2.4% from 4.1% in 2016, indicating increased lending to the government. The decline in GDP growth, increase in average inflation, widening of the current account deficit and decline of private sector credit growth all support the fact that 2017 was a tougher year than 2016. However, the outlook for 2018 remains positive, and we have since revised our GDP growth projection upwards to a range of 5.4% - 5.6% from an earlier 5.3% - 5.5%, driven by a recovery in the agriculture and manufacturing sectors, and continued growth in tourism, real estate and construction sectors. Rates in the fixed income market have remained stable as the government rejects expensive bids. The government is under no pressure to borrow for this fiscal year due to: (i) they are currently ahead of their domestic borrowing target by 28.5%, (ii) they have met 72.9% of their total foreign borrowing target and 88.1% of its pro-rated target for the current fiscal year, and (iii) the KRA is not significantly behind target in revenue collection, and therefore we expect interest rates to remain stable. With the expectation of a relatively stable interest rate environment, our view is that investors should be biased towards medium to long-term fixed income instruments. During the week, the equities market was on a downward trend with NASI and NSE 25 losing 1.8% and 1.6%, respectively. The NSE 20 however gained 0.3% during the week. 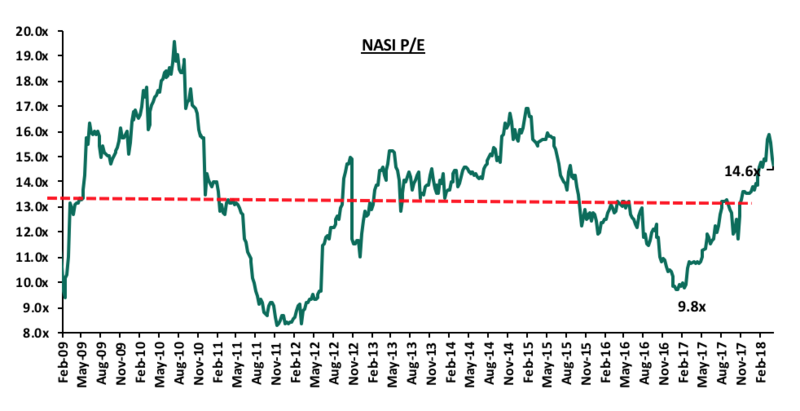 This takes the YTD performance of the NASI, NSE 20 and NSE 25 to 4.8%, 0.3% and 9.6%, respectively. This week’s performance was driven by declines in Standard Chartered, KCB Group and Equity Group that declined by 11.0%, 4.8%, and 4.4%, respectively. For the last twelve months (LTM), NASI, NSE 20 and NSE 25 have gained 34.7%, 17.7% and 32.8%, respectively. Equities turnover remained flat this week at USD 41.2 mn. Foreign investors remained net sellers of large cap stocks such as Safaricom. We expect the market to remain resilient this year supported by positive investor sentiment, as investors take advantage of the attractive stock valuations in select counters. The market is currently trading at a price to earnings ratio (P/E) of 14.6x, which is 9.0% above the historical average of 13.4x, and a dividend yield of 3.6%, lower than the historical average of 3.7%. The current P/E valuation of 14.6x is 49% above the most recent trough valuation of 9.8x experienced in the first week of February 2017, and 76% above the previous trough valuation of 8.3x experienced in December 2011. The charts below indicate the historical P/E and dividend yields of the market. The Central Bank of Kenya issued guidance on the implementation of the new IFRS 9 reporting standard by both commercial banks and microfinance banks (MFBs). The IFRS 9 replaced the International accounting standard (IAS) 39, regarding the methodology used to calculate the impairment provisions on financial instruments. Under the IFRS 9 standard, the impairment provisions shall be calculated under the Expected Credit Loss Model (ECL), replacing the previous Incurred Credit Loss Model (ICL). The ECL model requires provisions to be determined for expected future defaults on a loan portfolio. This is different from the previously used ICL model, which required the provisions to be set aside for only the incurred credit losses arising from non-performing loans. The new reporting standard is intended to improve credit risk provisioning by financial institutions, thereby enhancing these firms’ abilities to withstand any losses arising from poor asset quality. All provisions under the new ECL model will be charged from the income statement, thereby possibly impacting negatively some banks’ earnings. However, the provisions that shall be calculated from the performing loans shall be added back over a five-year period for the purposes of computation of capital. Banks will be required to start compliance with the new standard from 1st January 2018, with a five-year transition period. During this transition period, banks are required to disclose in their financial statements, the core capital and total capital ratios including the adjusted ratios, which are inclusive of the expected credit loss provisions. This will help in monitoring the impact of these additional provisions on banks’ capital position. In the event the provisions required to be in adherence to CBK regulatory requirements, on loan loss provisioning, are higher than those arising from the IFRS 9 standard, then the excess shall be treated as an appropriation of retained earnings and not expenses, when determining the profit and loss of the company. This excess, therefore, means that it shall be credited to the statutory loan loss reserve. The extended transition period is favorable to banks, especially the lower tier banks that are constrained on capital, and will be the worst affected during the ECL model implementation. We expect banks to adopt more stringent lending policies, thereby locking out risky borrowers, in order to mitigate the impact of expected credit losses on their respective capital position. Plans to repeal the interest rate cap are gaining traction with legal amendments to the law set to be tabled in parliament. A legal framework is being drafted to not only address access to and cost of credit, but also to enhance consumer protection. Treasury is set to come up with a raft of reforms, whose main agenda would be to resolve the high cost of credit and in the process lead to the elimination of the Banking Amendment Act 2015. The law played a part in contributing to the accelerated decline in private sector credit growth, which had already started to decline even before the law was enacted, as banks adopted more stringent lending policies in a bid to tame the declining asset quality as reflected by the increase in non-performing loans. The act was drafted with the objective to address the high cost of credit, which according to the CBK, is an objective the act has failed to realize, after one year in force. Instead, the law has inhibited credit growth, with private sector credit growth for the 12-months to March 2018 growing by 3.3%, way below the optimal 12-15% that is required to stimulate economic growth. Depositors in Chase Bank could start accessing their deposits locked in Chase Bank Limited through SBM Holdings. SBM Holdings recently completed the acquisition of Chase bank and the agreement was that they acquired 75% of Chase Bank’s deposits, together with a majority of staff and branches. SBM Bank Kenya will provide access to the deposits once the transaction process completes, and is approved by the Central Bank of Kenya (CBK). The bank was taken under the receivership of the CBK in 2016, with customer deposits of more than Kshs 100 bn. The acquisition will see SBM take control of the 62 Chase Bank branches, significantly increasing the foreign lender’s market share measured by number of branches in the Kenyan Banking sector. SBM has invested Kshs 2.6 bn in Chase bank, and is planning to invest a further Kshs 6 bn after the acquisition to revive the collapsed bank. The entire acquisition amount is yet to be disclosed. SBM Bank Kenya will absorb all the 1,300 employees of Chase Bank limited. This is the bank’s second acquisition in Kenya, having previously acquired Fidelity bank in 2016. The Kenyan banking sector has had 7 acquisitions since 2015. The transaction will see SBM Bank Kenya change status to become a tier II bank, ranked 11th on asset base, as Chase bank’s assets are valued in excess of Kshs 100 bn. SBM Holdings is adopting an inorganic growth model, with growth being driven by acquisitions, in its plan to diversify across geographies in Kenya and West Africa especially Ghana and Nigeria. We are “NEUTRAL” on equities for investors with a short-term investment horizon since the market has rallied and brought the market P/E slightly above its’ historical average. However, pockets of value exist, with a number of undervalued sectors such as Financial Services, which provide an attractive entry point for long-term investors, and with expectations of higher corporate earnings this year, we are “POSITIVE” for investors with a long-term investment horizon. South African-based Vantage Capital, Africa’s largest mezzanine fund manager, has acquired an undisclosed stake in the Rosslyn Riviera Shopping Mall for USD 8.0 mn (Kshs 800.0 mn). The Kshs 2.9 bn mall located along Limuru Road sits on a 4.5-acre piece of land and measures approximately 116,000 SQFT. Currently, Nairobi is the leading city in Africa outside South Africa in terms of mall space, with 761,805 SQM of available retail space. The yield on investment in retail space along Kiambu and Limuru Roads, where Rosslyn Riviera is located, currently stands at 10.6% against an average yield of 9.6% for malls located in Nairobi Metropolitan Area, whereas occupancy rates stand at 96.3% compared to an average occupancy of 80.3%. The occupancy and yields are an indication of the viability of the investment in Rosslyn Riviera Mall by Vantage. The investment is Vantage Capital’s 7th transaction in Mezz Fund III, a USD 280.0 mn (Kshs 28.0 bn) fund, with a 55.0% allocation to countries outside South Africa for investment in real estate projects. The firm recently invested USD 12.5 mn in Nigerian-based Purple Capital, which is the developer of 6,000 SQM Maryland Mall in Nigeria. The investment in Rossyln Riviera represents the 25th transaction executed by Vantage across three generations of mezzanine funds. Vantage manages funds in excess of USD 500.0 mn (Kshs 50.0 bn) invested in projects across Africa. In the Fintech segment, Digital Financial Services (DFS) Lab, a Fintech accelerator supported by the Bill and Melinda Gates Foundation, is investing USD 200,000 (Kshs 20.0 mn) in four African start-ups, two of which are Kenyan: (i) Cherehani Africa, which relies on mobile-based tech to provide credit and distribute personalized financial literacy content to women and adolescent girls who own micro-enterprises, and (ii) another unnamed startup that focuses on digital lending. DFS Lab identifies promising entrepreneurs and invests in for-profit companies that focus on consumers in sub-Saharan Africa and Asia. Products from the four companies have been found to simplify processes for accessing financial information and cash via mobile phone. Cherehani Africa provides access to finances to women and adolescent girls with basic level education, aged 17-45 years. On the fundraising front, the International Finance Corporation (IFC) announced that it led the USD 8.6 mn (Kshs 860.0 mn) Series A equity investment in Africa’s Talking, a Kenyan based communication-platform-as-a-service Application Programming Interface (API) startup. Africa’s Talking’s cloud-based software platform provides universal access to critical digital infrastructure that African start-ups and businesses need to scale. The software currently serves over 1,000 fast-growing digital companies, enabling them to create real-world applications faster and more efficiently. Africa Talking has operations in 7 African states including Kenya, Uganda, Tanzania, Nigeria, Ethiopia, Malawi and Rwanda. The funds will be used to expand to more countries. With more than 20,000 developers under its umbrella, the firm looks forward to adding more talent to this group as it gears to building more products. Private equity investments in Africa remain robust as evidenced by the increasing investor interest, which is attributed to; (i) rapid urbanization, a resilient and adapting middle class and increased consumerism, (ii) the attractive valuations in Sub Saharan Africa’s private markets compared to its public markets, (iii) the attractive valuations in Sub Saharan Africa’s markets compared to global markets, and (iv) better economic growth projections in Sub Saharan Africa compared to global markets. We remain bullish on PE as an asset class in Sub-Saharan Africa. Going forward, the increasing investor interest and stable macro-economic environment will continue to boost deal flow into African markets. Hospitality Sector: The accommodation and food sectors contribution to GDP grew by 0.1% points to 1.2% in 2017, from the 1.1% registered in 2016. The sector indicated strong signs of recovery, despite the harsh political climate, with growth coming in at 14.7% compared to 13.3% registered in 2016. This is mainly due to the recovery of the tourism sector where earnings grew by 20.3% to Kshs 119.9 bn in 2017 from Kshs 99.7 bn in 2016. The number of international visitor arrivals also increased by 8.1% to 1.4 mn in 2017 from 1.3 mn in 2016 with holiday travelers accounting for 68.4% while business travelers, in-transit and others accounted for 13.7%, 5.9% and 12.0%, respectively. However, the number of holiday and business travelers decelerated in Q3 and Q4 of 2017 by 1.8% and 2.4%, respectively, following the uncertain political period as well as negative travel advisories by western countries such as United States and United Kingdom (UK). Hotel bed-night occupancy rate increased by 0.9% points to 31.2% in 2017 from 30.3% registered in 2016 with the Coastal region and Nairobi accounting for most of the bed-night occupancy at 12.5% and 7.3%, respectively, of the total available rooms. The number of international conferences also reduced by 15.9% from 227 in 2016 to 191 in 2017 while local conferences increased by 2.4% from 3,755 to 3,844 over the same period. The report attributes the strong performance of the sector to enhanced security and intensified efforts by the government to market Kenya as the ultimate tourist destination. The KNBS findings are in line with the Cytonn Hospitality Report 2017 which had projected that (i) international arrivals would come in at 1.4 mn in 2017, (ii) business tourists arrival would decline by 0.4%, and (iii) a slight increase in the accommodation and food sector’s contribution to GDP to 1.2%. The hospitality sector is set for more growth driven by growth in Meetings, Incentives, Conferences and Exhibitions (MICE) and domestic tourism as well as continued marketing efforts by the government. As indicated in the Cytonn Annual Market Outlook for 2018, we expect the Kenyan real estate market performance to recover in 2018 driven by(i) attractive returns in the residential sector on the back of a high housing deficit and government incentives such as a 15.0% tax reduction for developers constructing more than 100 affordable housing units per annum, increased infrastructural development and increased focus by the government on affordable housing, and (ii) the expected growth of the hospitality sector. Due to the growth of international brands looking to penetrate the markets, the new and upcoming supply is increasingly of investment grade quality with the aim of attracting the foreign investors. Performance: Addis Ababa recorded the highest revenue per available room (RevPAR) at USD 192 compared to a regional average of USD 109, attributable to high demand from clients coming from non-governmental organizations, corporates and diplomats. In terms of occupancy, Kampala had the highest bed occupancy at 56.0% compared to a regional average of 51.6%, attributable to high demand from Uganda’s domestic tourism as well as regional tourists. · Nairobi’s performance was subdued registering the sharpest decline in RevPAR at 17.8% to USD 60 in 2017. However, it is expected to recover on the back of high tourist arrivals growth, public sector support for tourism, as well as new air routes in the long term. The Income Tax Act to offer higher tax rebates of Kshs 8,000, under the Home Ownership Savings Plan, to employees saving with mortgage institutions. Currently the tax rebates stand at Kshs 4,000 also through the Home Ownership Savings Plan which has been in effect since 1996. We commend the Kenyan Government’s concerted efforts, especially in the legal reforms front, aimed at driving the affordable housing initiative which is expected to bear fruits by matching the purchasing power of potential home buyers as well as pulling in the private sector in delivery of the 1.0 mn homes by 2022, as exemplified by various private developers such as Rendeavour who have committed to contribute to the initiative. We expect the real estate sector to improve on its performance this year given the recovery of fundamentals that support the sector’s growth such as (i) a rebounding tourism sector, (ii) intensified infrastructural development, (iii) economic growth recovery, and (iv) increase in household income due to an expanding middle class. conclusion by highlighting the outlook and investment recommendation. a robust real estate sector. increased supply in some themes such as commercial office, which saw the NMA record a growth of just 3.7% p.a, compared to the 6-year CAGR of 17.0%. The sector’s performance varied, with some zones experiencing price corrections such as Upperhill and Riverside, and others demonstrating attractive price appreciations of up to 12.0%, such as in Karen. The detailed analysis of performance by the various nodes and zones is as summarized below. Satellite Towns: Land in the area was categorized into serviced (site and service schemes) and unserviced land. The land sector recorded positive growth rates in most areas in NMA, recording an annual appreciation of 3.7% y/y from 2016, attributable to the tough operating environment in 2017. High rise residential areas recorded the highest capital appreciation rates, growing by 4.8% y/y. The growth was supported by high returns per unit of land value as the areas allow for densification, and increased demand for housing from the growing middle-income population. Areas zoned for commercial development such as Westlands and Kilimani recorded annual appreciation rates of 3.4% y/y, down from a 6-year CAGR of 20.0%. The slowdown in growth is attributed to the increased supply of commercial developments, with offices having an oversupply of 4.7 mn SQFT in 2017 and therefore a decline in demand for land for commercial developments. Site and service schemes had the lowest appreciation rates with the asking prices growing by 2.7% y/y, lower than the 3.0% recorded for unserviced land in the same localities. This implies that buyers are not willing to pay a premium for the services provided, rather opting for unserviced land in areas such as Ngong, which is 36.0% cheaper, and provide the services for themselves. Given the above performance of the various areas, the investment opportunity in the sector is in markets with high returns such as Karen, Kilimani, Ridgeways, Juja and Kasarani which recorded annual capital appreciation rates of more than 5.0% in 2017, and Thika which offers site and service schemes investors the highest expected returns of on average 9.7% against a market average of 3.7% in 2017, thus making these areas the most attractive areas both for land and real estate development. For the 2017 Land sector outlook, we had three out of the five metrics as positive, and two negative and thus a positive outlook for the land sector in Nairobi. For 2018, we have four of the metrics under consideration are positive and one neutral, thus we retain our positive outlook for the land sector in Nairobi and we expect the land and real estate market to record better performance in 2018. We expect increased investments in the sector driven by i) infrastructural development with the government expenditure on infrastructure expected to increase by 14.2% in 2018 from 2017, ii) the conclusion of the electioneering period and iii) relaxation of zoning regulations in some markets thus making them more attractive for real estate development.